Danish Army Specific: Introduced in 1944/45 at the Danish Brigade (DANFORCE) in Sweden. The Danish Brigade was formed by Danish refugees, and was planned to secure law and order in Denmark after the German capitulation. The picture was probably taken in the early days of May 1945 showing a rather young member of the brigade. Historical: Military design derived from late 1930´s Husqvarna 112Tv. Engines and gear boxes produced by Albin. Assembled by Monark, who produced the remainder of the bike. 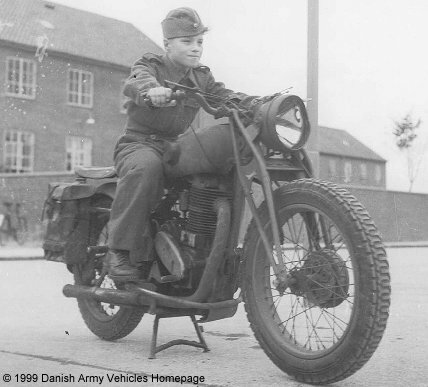 Known in Sweden as Army Bike M/42. Length: 2.12 m (82 inches). Width: 0.74 m (29 inches). Height: 0.94 m (37 inches). Weight: 200 kg (440 lb.). Engine: Albin 1-cylinder, 0.496 cm3 (30 cubic inches) displacement, air cooled, carburetor. Horsepower: 20 at 4.200 rpm. Fuel capacity: 13.5 liter (0.29 gallon).